St Nicholas Hospital, St Andrews Scanned image only. The Hospital of the Blessed Nicholas in St Andrews must have been one of the earliest leper houses in Scotland, probably founded at the end of the twelfth century. The founders may have been the Prior and Canons of St Andrews, "for it is not known that that other founding body, the Knights of St Lazarus, ever had a footing in Scotland, and some neighbouring religious house usually charged itself with the government of these foundations". "In those days the coast road left St Andrews by a route much further east that it does now, and the hospital was probably set down on the waste between it and these," probably near the farm called St Nicholas (NO 5182 1595). From the fact of a dedication and also from the language of the charters, it appears probable that the hospital was provided with a chapel and graveyard. By the early sixteenth century leprosy was beginning to die out and disappear. This was probably the case with St Nicholas hospital, for about this time its endowments were conveyed to the Dominican Convent in South Street, St Andrews (NO51NW 5). The farmer of St Nicholas Farm stated that numerous human skeletons (at least 30), including the complete skeleton of a young girl, were found about five years ago while digging for drains and silo pits within, and on the north side of, the steading at NO 5179 1597. Some of the remains were hardly a foot below the surface of the ground and were without graves or coffins. After examination (not known by whom) the remains were reburied in the same area. It seems probable that this is the site of the leper burial place. The farmer also stated that ploughing within a small area centred on NO 5195 1580 had revealed several dressed stones from what may have been the foundations of a building. Field inspection of the site proved negative but the site may be that of the leper hospital. Visited by OS (EGC) 16 July 1964. NO 5175 1585 Excavation in advance of the construction of a leisure complex and associated car parking were carried out between November 1986 and March 1987. The western boundary wall of the Leper Hospital complex was located with a rectangular building built against its E face at the N end of the site. At least five phases of activity were identified in the area occupied by the rectangular building. In the final phase the building had an internal clay floor, a doorway at its NW end and a large sub-circular extension butted to its SE end. From the pottery evidence the building seems to have been demolished and levelled in the 14th/15th centuries. This building may have been a bakery or cookhouse for the Leper Hospital complex. Trial trenching elsewhere in the development area located a long sandstone wall, 75m E of the W boundary wall, which may have marked the eastern extent of the hospital complex. Finds from the excavation include a small group of local white gritty ware pottery including some unusual vessel forms, an annular copper brooch and a worked antler bone tine. Some disturbed human bone was recovered but no sign of the hospital cemetery was found. NO 517 159 Pipe trench close to excavated 12th century hospital. A few sherds of medieval pottery, but no well defined archaeological horizons. Sponsor: SDD, HBM, SUAT. NO518 160 A watching brief was carried out by SUAT in December 1989 during construction of a new coastguard station to the north-east of St Nicholas steadings. No sign of archaeological horizons was noted. NO 5170 1580 Trial excavations by SUAT to the W and SW of the area excavated in 1986-7 was undertaken in advance of the sale of the land for a housing redevelopment. Further stretches of the hospital's western boundary wall were located along with substantial amounts of extra-mural activity, apparently of medieval date. NO 519 159 A watching brief and small excavation were carried out on behalf of Fife Regional Council between March and June 1994 along the line of the St Andrews Interceptor Sewer Pipeline at St Nicholas Farm. Medieval remains were anticipated as SUAT had found such remains in the vicinity in 1993. Two trenches were excavated by machine. In Trench 1 several stones, animal bone fragments and a medieval sherd could have been from the vicinity of the precinct E wall. In Trench 2 field drains of various types, probably of 19th-century date were noted. A fragment of wall at the E end of the trench, possibly the S precinct wall, had been broken through and largely destroyed when a man-hole was dug for the pipeline. Report available from St Andrews Heritage Services. Sponsors: Fife Regional Council, St Andrews Heritage Services. NO 518 158 An excavation was carried out prior to a housing development at the site of the medieval leper hospital of St Nicholas, in February and March 1997. Previous investigations had established the location of the precinct of the hospital under the car park of the East Sands leisure centre and the presence of possible extra-mural settlement further W in the field adjacent to the sewage treatment centre (see Proudfoot 1994). The remains of a large structure, defined by a substantial drystone wall, 0.87m thick, on a WSW-ENE alignment and including a series of stratified decomposed organic layers and cobbled surfaces, was recorded. Green-glazed pottery, dating to the 16th century, was recovered from the foundation trench of this structure, immediately adjacent to the course of the St Nicholas Burn. At a later stage another slightly less substantial wall was constructed. These structures may belong to the redevelopment of the leper hospital in the 16th or 17th centuries. The partial remains of a cobbled surface, on the same alignment as the medieval Crail Road, also identified in previous work, was also recorded. This represented the only medieval activity apparent S of the present sewage works. A watching brief was carried out during topsoil stripping of the entire development area. In addition to several modern pits and animal burials, a heavily disturbed isolated long cist burial was discovered and recorded. No skeletal remains survived. No evidence of activity belonging to the earlier phase of the site, relating to the leper hospital, was recovered. A report has been lodged with the NMRS. Sponsor:	Hall & Tawse Scotland Ltd.
NO 5190 1575 A watching brief was undertaken during the erection of a pre-school nursery due S of the East Sands Leisure Centre and to the SW of the site of previous excavations in 1986-87 (Hall 1987). Ploughsoil to a maximum depth of 1.5m was located across most of the site directly overlying natural sand. A possible cobbled trackway was recorded at the SW end of the site but there were no artefacts associated with this feature. It would appear that this part of the hospital precinct was always used for agriculture and never contained any built structures. Four samples of human bone were submitted for dating. These all came from features or deposits pre-dating the excavated hospital buildings. Calibrated dates of 1530_1310 BC, AD 530_660, AD 130_390 and AD 430_650 were obtained. These results may suggest the presence of an earlier graveyard on the hospital site. Derek Hall managed an Historic Scotland funded project to record medieval hospital sites in Scotland. Gazetteers were produced for each regional council area between 1997 and 2001 with an overall review in 2001. NO 5175 1585 SUAT was commissioned to undertake an archaeological site assessment in advance of a housing development. 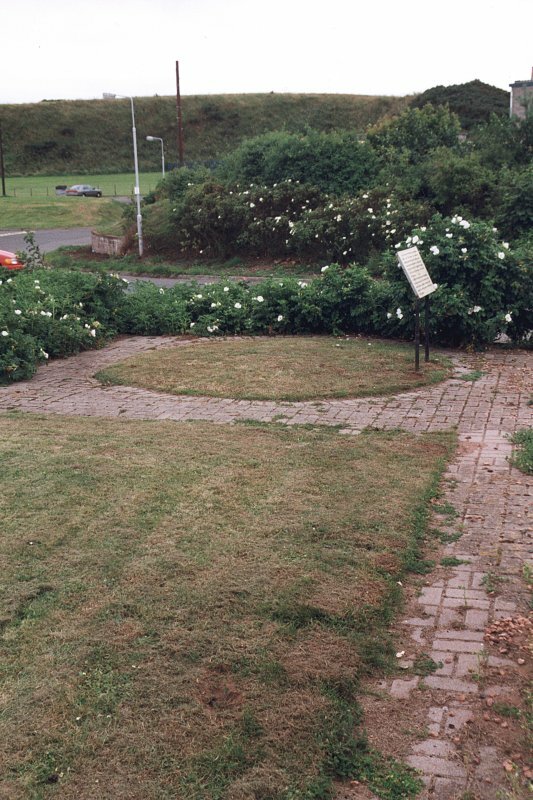 Resistivity survey, followed by a programme of trial trenching, was carried out on the site which lies immediately to the E of the excavation area which located part of the medieval St Nicholas Leper Hospital in 1987. The information recovered, including walls and drains, has largely complemented the results of previous archaeological work, notably a limited assessment carried out in 1993 (Moloney 1993). It remains unclear whether the remains encountered represent extra-mural settlement or part of the hospital complex. No securely stratified finds were recovered from the site, which is characterised by plough disturbance, shallow stratigraphy and isolated features. Headland Archaeology were commissioned by Alunmo Developments (St Andrews) Ltd to undertake an archaeological evaluation at the site of Wonder Years Nursery, East Sands, St Andrews, Fife. The site lies within the area covered by the former complex of St Nicholas Farm Leper Hospital, a medieval institution known to have existed between the 12th and 16th centuries AD. Although much of the proposed development has previously been developed and lay on the south-western perimeter of the medieval hospital, away from the main buildings complex, it was deemed that there was still the potential for archaeological remains to survive in those parts of the site though not to have been previously developed. In total seven trial trenches and 19 test pits were excavated equating to 400 square metres or approximately 10% of the area of previously un-investigated site. The trial trenching and test pitting revealed that contrary to expectation the entire site has been largely disturbed by modern development, with made ground deposits of up to 1.50m in depth present in all of the seven trenches, overlying the geological sands. This is consistent with the site having been levelled and landscaped during the construction of the current nursery buildings in the 1990s.